Barr and the IG need to weed out the bad apples at the FBI and the DOJ. Enough already. 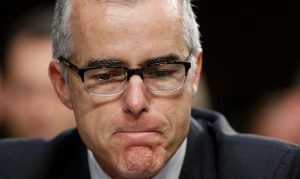 Republican investigators on the House Intelligence Committee formally requested former acting FBI Director Andrew McCabe’s work-related text messages as part of their surveillance abuse inquiry last March, but they were denied, according to two sources familiar with the matter. The sources questioned whether the rejection amounted to an obstruction of congressional oversight, after Fox News on Friday published previously unseen texts between then-FBI Deputy Director McCabe and FBI lawyer Lisa Page discussing numerous Foreign Intelligence Surveillance Act (FISA) matters. An attorney for McCabe, the FBI, and the DOJ did not respond to Fox News’ requests for comment following the publication of the texts on Friday. Other individuals included in the House GOP’s request for information were former FBI Director James Comey, then-Special Agent Peter Strzok, and senior DOJ official Bruce Ohr — who became a back channel between Steele and the FBI, after Steele was fired by the bureau on the eve of the 2016 presidential election over his contacts with the media. “The answer from DOJ was, ‘We’re working on this’ — kicking the can down the road was a constant theme,” one source explained. On Thursday, Justice Department Inspector General Michael Horowitz, speaking during a panel discussion in Washington, D.C., confirmed that his office is continuing to probe potential Foreign Intelligence Surveillance Act (FISA) abuses.